The Punjab Examination Commission (PEC) has officially announced that the 5th class annual examination result will be declared on 31st March 2019. The result is scheduled to be released at 10:00 am and all of our visitors will be able to check their complete result through our website with extreme ease and convenience. The Punjab Education Commission (PEC) had conducted the annual 5th class examination 2019 during the month of February this year. For this purpose, the registration process had started during last year and date sheet was announced during the month of December. The PEC conducted the examinations of 5 subjects including Islamiat, English, Urdu, Science and Mathematics which started in February 2019. Punjab Education Commission (PEC) is the authorized body who is responsible for conducting the annual 5th and 8th class examination in all 36 districts of Punjab. PEC not only conducts these exams on timely, fair and transparent way but also announces the result within next 2 months of the examinations. 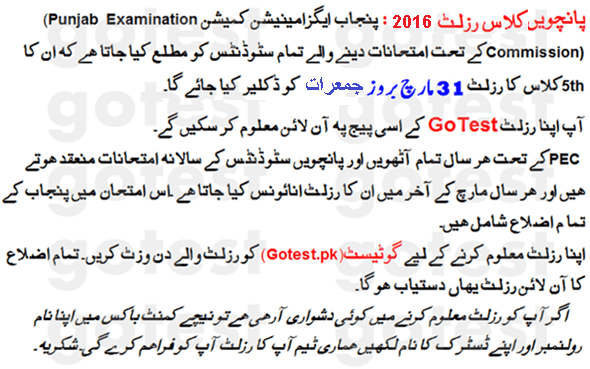 By continuing its impressive previous years record, Punjab Education Commission (PEC) has announced to declare the 5th class result after almost one and a half month and just like always, Gotest.pk is also continuing its tradition of facilitating its visitors in every possible way. So all the students who had appeared in PEC 5th class annual examination from any district of Punjab, will be able to check their result through our website without any trouble. The complete result of all Punjab districts will be available on our website immediately after its announcement by the official authority. The process of checking the result online is extremely simple but if you are still facing problem while doing so, you can let us know about it via comments section and we will provide you complete relevant guidance for resolving it.